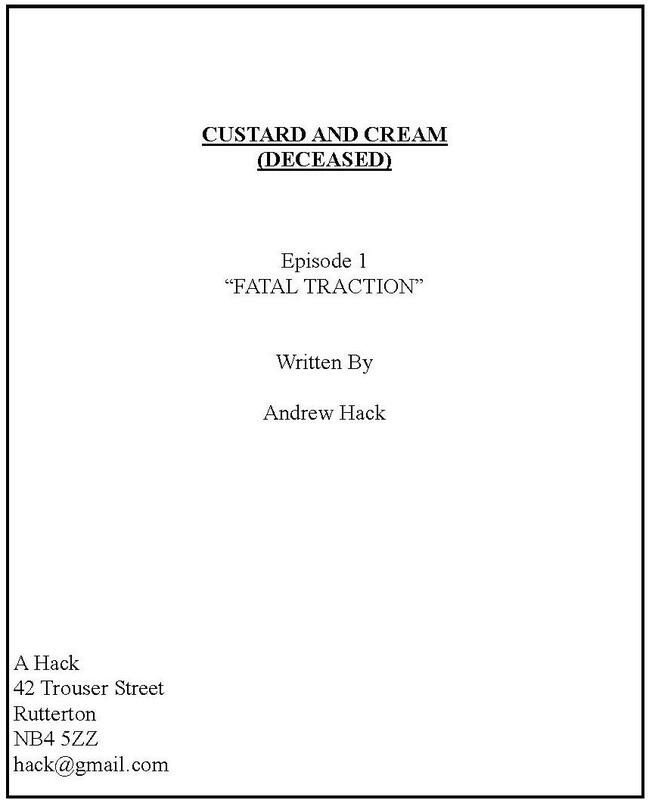 Please find enclosed a treatment and script for my thrilling new detective series ‘Custard and Cream (Deceased)’ which I think you’ll find both humorous, exciting and full of intrigue! 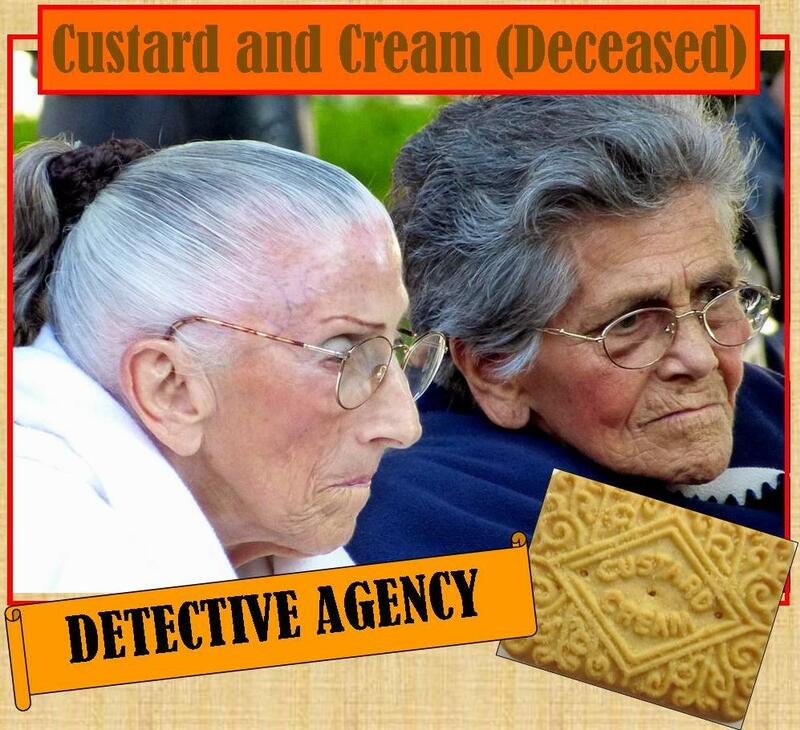 Two old ladies, former workers at a biscuit factory, team up to fight crime. It’s a detective series with a twist, though – one of them is nearly dead! I am confident that with such a distinctive hook it could be a Saturday teatime sure fire ratings winner and easily filmed on a small to medium budget. Since the BBC is hardly strapped for cash, I think my rate of £7500 per six draft scripts is pretty fair – but I am open to negotiations. Fingered by the police; unjustly convicted for attempting to poison biscuit mixture by urinating into it, Liverpool comrades Alma C’ustard and Betty Crème were released from Holloway Prison aged 75. Determined to fight crime wherever they find it and bring wrongdoers to book, they pose as two dotty old market gardeners and befriend local likely lad and police informant Huggy Dog, a hip hop breakdancing graffiti artist from the rough side of Croxteth Heath. 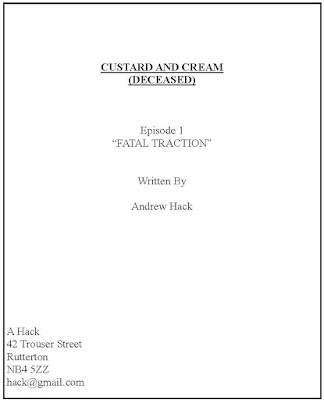 And they have one unique advantage over the criminals – Betty has been told by Ted McNoflock, an itinerant Scottish vicar, that she could be nearly dead! She can now dress in a white smock, pretend to be a ghost, and frighten criminals into confession! GRAMS: Hire John Barry immediately. He’s quality. If Barry is unavailable, dead or you are too miserly to commission him, then something mysterious yet quirky, played on a Stylophone, to emphasise the strange nature of the detective duo. one’s alive and the other is nearly dead. GRAPHICS: A mixture of live action and animations in blood red. It might be class to have one of them stretching out their palm at a car trying to run them down, then cut to the other at their graveside. Something like that? It is raining dog’s abuse on a field which we see from above. In the far corner, getting pelters, is a large, old fashioned traction engine. The hood and funnels are smoking and drops of rain sizzle and spit as they bombard the chassis. Underneath the gigantic steel wheels is a crushed corpse. Its (male) face is twisted into a permanent mask of horror as though it witnessed the oncoming engine and was unable to escape being crushed. The rain is turning the field into a soggy mess of vegetation. Only fools would be out on a day like this. At the other end of the field we see two ladies: Alma C’ustard and Betty Crème. Betty is, as usual, dressed entirely in white. As we zoom in, we see both have trowels and are digging in the shrubbery. They seem not to have noticed the horrific scene in the other corner of the field. Oh, good gracious me. What have you got, Betty? I think it is a rare species of some nettles. Smell this. That stings a bit. Get it away will you? Sorry, Alma. Do you want some tea? Oh yes, what have you got? Both laugh uproariously as if sharing a private joke. Still shaking with laughter, Crème unscrews her thermos and pours C’ustard a beaker full who takes it. They sit on the sodden fields, chewing thoughtfully, and now notice the traction engine smoking at the far end. A man is running away in the opposite direction. The man is dressed in overalls decorated with arrows, wears a mask that obscures his features, has a ball and chain attached to his left ankle and is carrying a sack which has the word ‘swag’ written on it in large letters. This is the villain. I say, Betty, a man! Enjoying a walk in the countryside I expect. Could you pass me another biscuit? …tired? Tired of this never ending life of crime busting whilst posing as dotty market gardeners? Tired of finding murder after murder in improbable locations and solving them within an hour? Tired of pretending to be nearly deceased? No. Tired of custard creams. Ever fancy a garibaldi? Course not. Then we’d be Gary and Baldy (Deceased), wouldn’t we? Thank you for your treatment and script, which we read with interest. Unfortunately, we currently have no plans to commission a new detective series like the one you have sent us. We find the public have no taste for bizarre and incredible situations such as those contained in your script.